Clinical Hypnotherapy Certification is an important part of training to be a hypnotherapist. Avoid these two common mistakes and graduate with confidence. Recogise that not all Certificates and Diplomas are equal. To graduate as a fully qualified hypnotherapist who is eligible for professional indemnity insurance and membership of accredited associations such as the General Hypnotherapy Register you must complete a minimum of 120 hours of classroom based training. Courses that call themselves ‘Diploma Courses’ and are less than that minimum fall short of the accepted standards. This can have a negative knock-on effect on your insurance eligibility in the unlikely event that someone claims malpractice against you. Specific learning outcomes must be attained by all accredited diploma course providers. Schools that are not assessed, validated and accredited by organisations such as the General Hypnotherapy Standards Council or the Hypnotherapy Practitioners Diploma aren’t operating to the high generally accepted standard. Poor standards result in poor training. This can have a negative knock-on effect on your confidence and your ability to deliver results to your clients. The reason for posting this because here at Hypnotherapy Business Academy and at the Irish Hypnotherapy Association we receive a lot of complaints from graduates who have clinical hypnotherapy certification from other schools that falls short of the accepted standards. 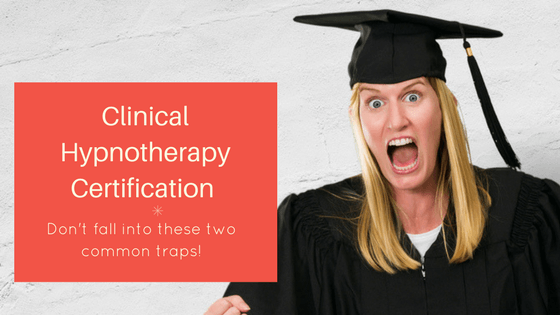 They are very upset that the colleges they trained with didn’t provide sufficient information to help them make an informed decision and get the level of clinical hypnotherapy certification they had expected. They struggle to develop successful hypnotherapy practices because they have only learned to deliver basic interventions or have learned hypnotherapy from recommended scripts. When clients fail to get results they don’t have the knowledge to push through failure mentaility and help their clients achieve the results they expected. As a result of this, we created a bridging course to help graduates from other courses raise their skills up to the accepted standard. However, this isn’t always an option for some graduates from these courses, who can’t afford to retrain and don’t have the confidence to use the skills they learned to generate an income to re-invest into their professional development. Before booking any clinical hypnotherapy certification course, speak to the tutor and make sure the course is fully accredited by an organisation such as the General Hypnotherapy Standards Association. Ensure that you can join the General Hypnotherapy Register and the Complementary and Natural Healthcare Council’s register of professional therapists. Make sure that the insurance you are offered is based upon your completion of the national minimum standards of 120 hours of classroom based training. If you are confused and unsure what your next step should be, you can book a complimentary clarity call with Susan Wallace. This call will help you get clarity on focus on the options open to you. Click on the link to the home page. Scroll to the end of the page and watch the short video to learn more about the benefits of a clarity call.